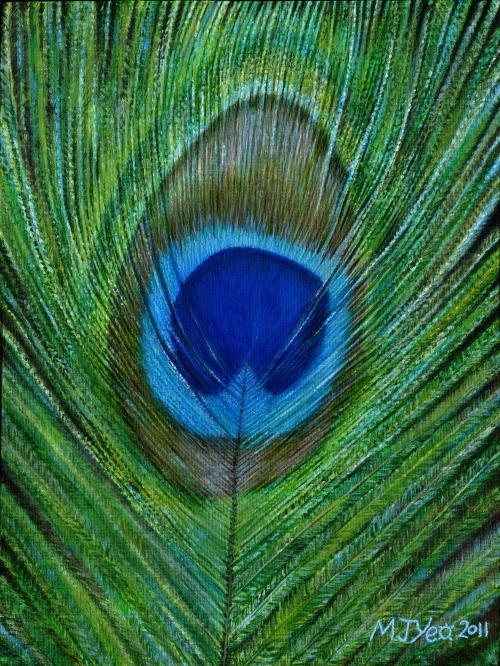 My children brought a peacock feather home from school to practise their 'circus skills' of balancing the feather on their nose with. I quickly took photos of it for future art reference before they could mangle it! In my painting I wanted to show all the beautiful colours and try to capture something of the iridescence, which was quite a challenge. I also found the way the curve and direction of each barb of the feather followed each other to form its overall shape, beautiful, and wanted to show this correctly.